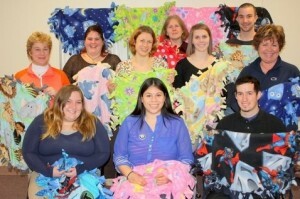 OSWEGO – Oswego County AmeriCorps members recently donated more than 40 fleece blankets to the Oswego County Health Department’s Maternal Child Health Program for families in need. The blankets were created by AmeriCorps members as a special project in recognition of Martin Luther King Day. Oswego County AmeriCorps members donated more than 20 fleece blankets to families served by the County Health Department’s Maternal Child Health Program. Pictured front row, from left are: AmeriCorps members Amanda Quaile, Ruth Vasquez and Mike Monroe. Second row, from left are: Diane Oldenburg, senior public health educator for the Oswego County Health Department, AmeriCorps members Michelle Pawlenko, Jenna Skubis, Leslie Ross, Emma Donovan and Kyle Mosack and Judy Lester, Director of Patient Services for the Oswego County Health Department. AmeriCorps Program Assistant Carrie Victory and Program Coordinator Kathy Andolina assisted with the project. Oswego County AmeriCorps is accepting applications for the summer AmeriCorps program. Members will provide fitness education and nutrition activities to youth around Oswego County. Summer members serve 300 hours, receive a living allowance of $2,113, and an education award of $1,175. For more information, contact the Oswego City-County Youth Bureau at (315) 349-3451 or 1 (800) 596-3200, extension 3451.